“Great people weren’t born great. These people were forged, carved and prepared with good education.” That statement from the famous writer Mohammad Fauzil Adhim seemed to reflect the enthusiasm of the participants in the Doctor of Research in Management Scholar Track Program (Class 4 – Phase 3). The event was held on Friday, September 6th 2013, at the Lounge Room on the 8th floor of Kampus Anggrek BINUS UNIVERSITY, was packed into a three-hour interactive dialogue. Dr. Mts. 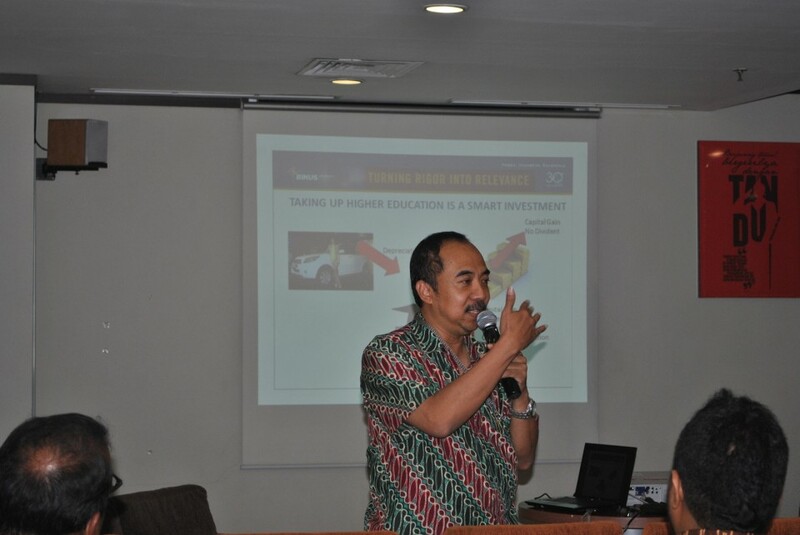 Arief, MBA, CPM – DRM Content Expert came to explain the program. At first, the Doctor of Research in Management Scholar Track Program was designed for academicians and researchers. However over time, this program apparently has attracted an increasing interest from students at BINUS and the general public. Seeing the positive potential, BINUS opened the Doctor of Research in Management Scholar Track Program for public.